Four more horses from my collection, now handmade. Sleeping horse, plush horse (these two plush toys are made by an Ukrainean toy-artist (unfortunately, I don't remember her name). My most beloved horse, made from the white metal (rather heavy, I would say:) He's OOAK in this scale. Bought about five years ago on some war miniature fair in my country. This steed is called Invincible. 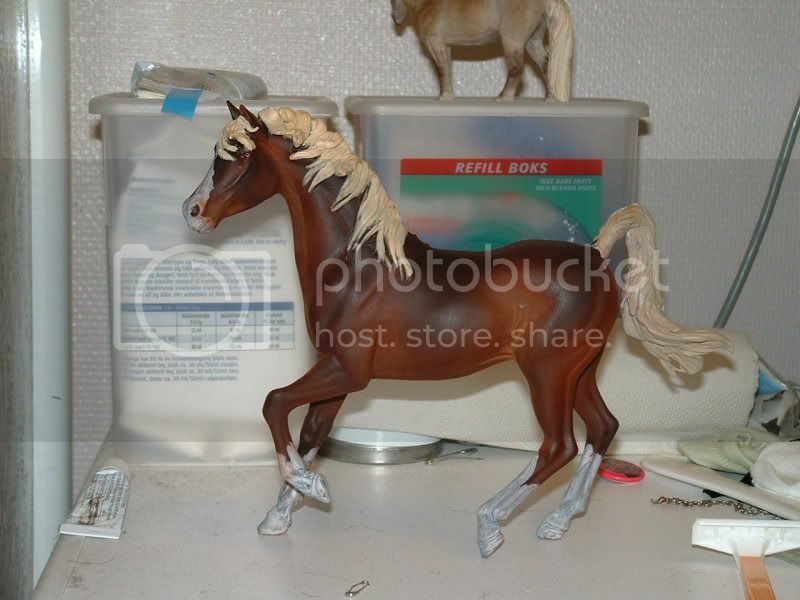 This is a dark dappled bay arabian, mould Breyer Craft Arabian, painted by a Russian artist Chernetsova Anna. This one is stunning! What a treasure!! What a lovely herd of customs! I love them all, but I think my favorite is Barometer (I have a custom on that mold myself). Oh, and have you got any photos of that custom? I thought I did, but apparently not... here's a picture from when I was painting her. Wow, she's really beautiful. A really nice girl. Is she supposed to be sorrel or silver bay? And who's standing above her, on the box? Is it a Safari haflinger mare?